As an early elementary teacher, there are so many things we have to introduce to our little learners. From social interaction to academics, we are laying a very large foundation of skills. Reading is the big one. Huge, in fact. You can’t do anything until your little learners start to read. And one skill that I worked on consistently was referring back to texts. Surprisingly, this is a hard skill to master. Why? Not sure, but I came up with a fun activity to help with just that! This sweet book is one of my favorites! It’s about a cuddly bear and a tiny mouse out on a nature walk. They are chitter-chatter-talking, and they notice all the beautiful colors around them. They meet new friends along the way, but Bear still continues to notice all the beautiful colors. I love the rhyming in this book. This makes a great mentor text for your older or more advanced students. It could also be a great book to use when introducing a rhyming unit. But what I use this book for the most is referring back to the text. As our learners get older, our books get more advanced and filled with more information. We don’t expect them to remember everything! And what’s great about this book is that it can be a review on your colors! 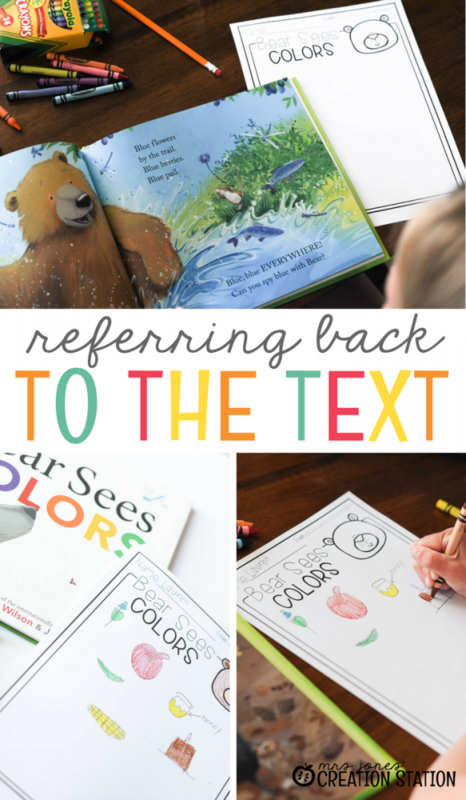 Before I read the pages similar to above, I call out the color and have my learners guess what Bear would see in the woods. They loved this and turned so competitive! After I read the book during my circle time, I place it in my literacy center for my students to read again. I provide a printable for them to fill out. I encourage them to refer back to the text to draw what Bear saw in the woods. Of course, I model this with other books weeks before this activity. Starting this skill now will not only help them at this age, but it will become a habit for them as they become more mature readers. From talking with upper elementary teachers, I came to the conclusion that this skill is still very hard for older learners. This skill is definitely something that can be taught consistently to help them become better readers in the future! To grab your FREE printable, click on the link below! Are you in search of more mentor book activities? Click on the links below! Fish Eyes is a great math book to use with your addition unit, but it’s also a great book to use in your literacy block! There’s no reason you can’t use one book for two lessons-and it saves you a ton of planning time! Another one of my favorites (I can’t have TOO many favorite books!). Fish Wish is a colorful book filled with sensory language that will take your writer to the next level! Keep this one tucked back for fall, because it’s worth it! This is a great lesson on how change happens to animals’ homes during the fall. I can guarantee you can find a reading skill you can review or introduce as well!